The singer-songwriter withstood personal adversity and has a new record to show for it. Cover photo by Madison Simmons. Cover design by Louis Dixon. 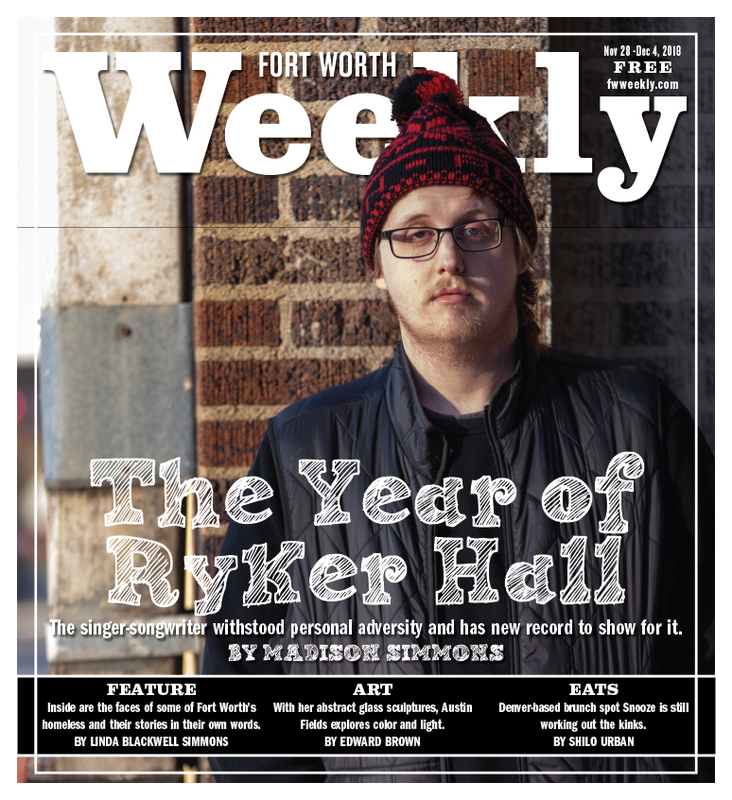 The year 2018 hasn’t been kind to Ryker Hall – the person. He lost his digital marketing job and two grandparents died in quick succession. Ryker Hall, the singer-songwriter, however, has enjoyed a modicum of success. He’s gigged more than 50 times and is set to release his debut solo record, Soon You’ll Be a Skeleton, on Dec. 7. Ironically, it was his personal tumult that shook him into action, he said. He recorded his self-released four-track EP at Denton home studio Holophoner Records, with engineer Eric Daino at the helm. 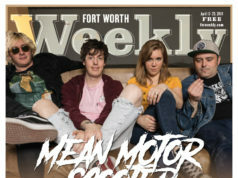 Ryan Weiss and Spencer Wharton, both of Dallas/Denton trio The Infamist, played drums and bass, respectively, with Harrell Petersen (The Holophonics) on trumpet and keys. Fort Worth songstress Simone Nicole contributed harmonies on one track. 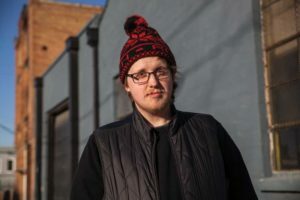 The Longview native describes his style as “Americana emo,” in the vein of his heroes Fall Out Boy, but with his own folksy touch that adds earnestness and clarity to his sound. Over the past year, he’s become a familiar face on the oft-insular music scene, thanks to regular gigs at the likes of The Tin Panther and Off the Record. Hall: “I just started doing what I wanted dto do.” Photo by Madison Simmons. He is also, to use his words, a “low-key” rapper. Though he shrugs off his rap persona as a joke, he said he’d love to release a tape someday. For now, being a singer-songwriter remains his focus. 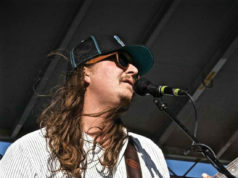 Hall learned to play guitar at the age of 10 while growing up in Keller. He spent his middle-school years soaking in Green Day, Nirvana, and Blink-182, and he started a few bands as a teenager, including what he called a “terrible pop-punk band,” Signed in Scarlet. Those early forays into punk have left their mark on his style, according to Daino, who said he hears Hall’s pop-punk and emo influences shine through in his songs. “It’s singable, guitar-driven, with an alternative ’90s vibe,” Daino said. Hall writes straightforward rock that works itself into your head and stays a while. In the lead track, “Seasons,” a drone-y, grunge-inspired chord progression builds a runway for Hall’s voice, smooth and slick. The three-minute tune feels warm and stripped-down, and it’s animated by a steady beat punctuated by occasional tom fills and cymbal splashes. Hall throws his voice into vowels, leaning in and holding the “ah” in the opening word “nostalgia,” evoking his emo predecessors. Lyrically, the song suggests equal parts despair and hope, as he tells the story of a frustrated guy who remains optimistic about his future. “Nostalgia / It hangs in waves,” he sings plaintively. “The memories get heavy / But the future’s on its way. Working the line at a restaurant in North Richland Hills or, as he put it, “yelling and making plates,” pays the bills for now. Hall plans to move into Fort Worth or Dallas soon and to spend more time playing, but he takes pride in the year he made for himself. He plans to record a full-length record in 2019. Congrats Ryker!! I know your dad is extremely proud of you…..us too!! !